Steady run up in the underlying price of natural gas over the past two weeks, which is having an impact on the price of electricity. 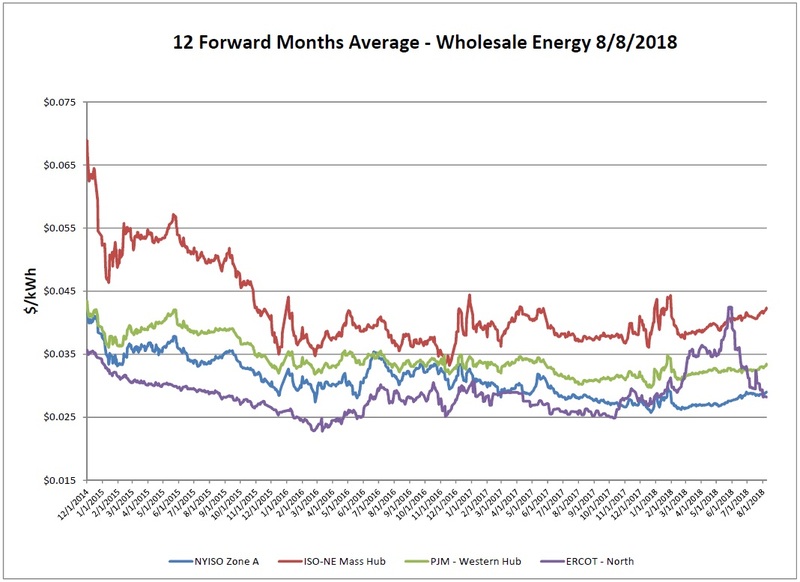 In PJM and NYISO price movement was fairly small throughout the week, though generally increasing. However in ISO-NE, price movement tended to be a bit larger than the other northeastern markets compounded by the increase in the Algonquin basis. It appears for the time being that prices have bounced off the lows and we’ve seen prices climbing back up. Also noteworthy in New England, on 7/31/2018, the Massachusetts Legislature passed bill H.4857 (found at the following link: https://malegislature.gov/Bills/190/H4857 ) aimed to promote a clean energy future. The new law changes concern renewable requirements and all MA customers and suppliers will be affected by these increases. Each supplier may treat these requirements differently and executed agreements currently in effect or those which have not started yet may see these increases as pass throughs. Beginning 1/1/2020 RPS Class I obligations escalate year over year by 1%. This will now change to an annual escalation of 2% and will continue until 2030, after which it returns to the 1% annual escalation. Beginning 1/1/2019, every supplier will have an obligation to provide a minimum percentage of sales from clean peak resources. It is difficult to establish cost estimates at this point but the obligation will be met through clean peak certificates and will increase by no less than 0.25% annually. As expected, temperatures were up over the report week, causing upward pressure on the day ahead market. In ISO-NE a new peak demand for the year was set on August 6th at 24,685 kW, quite a bit above last year’s peak of 23,508 kW. This will currently be used to determine next year’s cap tag unless this is replaced later this season. *Please note that the 2019 Future predictions were added. 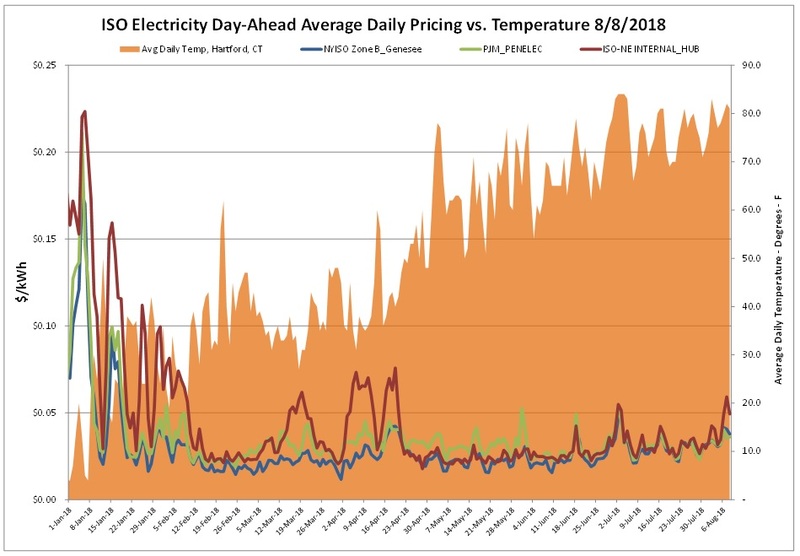 The remaining 2018 contract prices are trading in the upper range of the “normal/average” range, likely due to the relationship between storage and the price of energy placing upward pressure on the fall and early winter months. 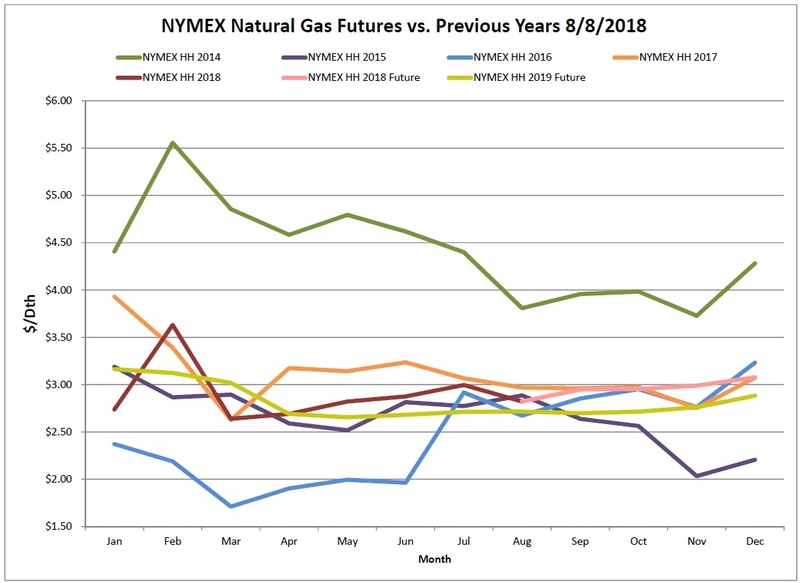 At the NYMEX, the overall 12-month strip rose 9 cents on the report week, while the September 2018 contract price rose 19 cents. Weather forecasts call for heat returning to the West Coast and Northeast, which will hinder any relief for natural gas demand for power generation and air conditioning load. 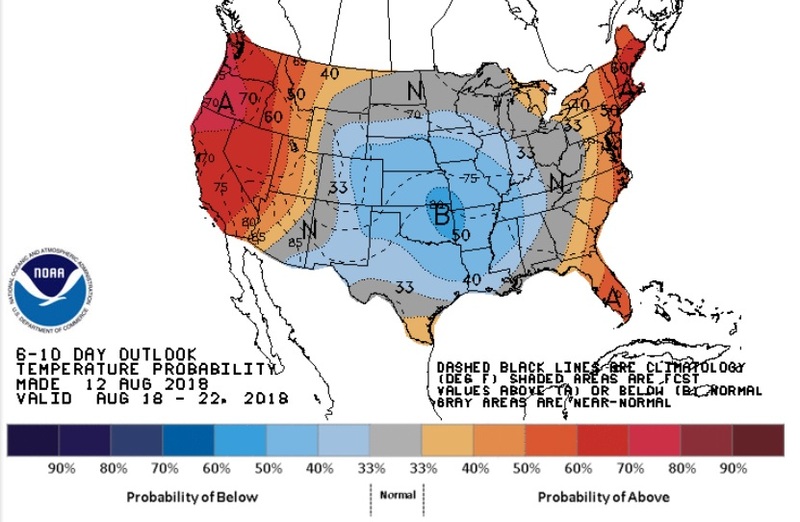 If heat continues throughout August, it will have the potential to continue low storage injections and put upward pressure on pricing going into this winter. Also worth noting is China’s proposed tariffs on U.S. liquefied natural gas. 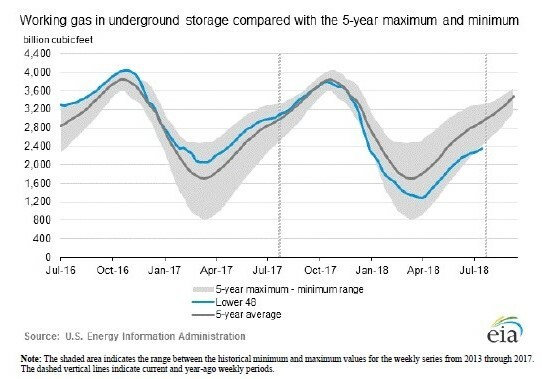 With China being the third largest consumer of U.S. LNG exports, their recent threat to impose a tariff on U.S. LNG could certainly hinder the LNG export outlook for the U.S.
As of Friday, August 3, 2018, working gas in storage was 2,354 Bcf. According to EIA estimates this represents a net increase of 46 Bcf from the previous week. For the first week in many the storage report came in very close to expectations, however still well behind previous year averages. 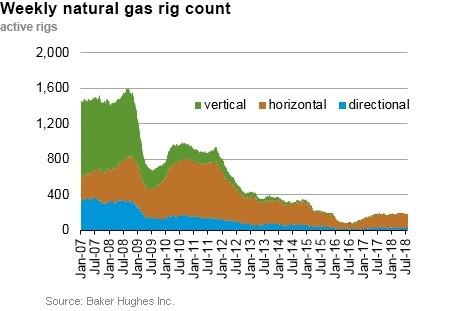 The Baker Hughes exploration gas rig count increased 3 rigs from the previous week for a total of 186 rigs. The report total came in 5 rigs more than were in operation last year when there were 181 rigs. Weather forecasts show a continuation of the pattern that has been in place for several weeks now. Warmer than normal conditions on the west coast and north east, while the middle of the country will remain cooler or even below-average. NEW YORK/BEIJING (Reuters) – China’s proposed tariffs on U.S. liquefied natural gas and crude oil exports opens a new front in the trade war between the two countries, at a time when the White House is trumpeting growing U.S. energy export prowess.